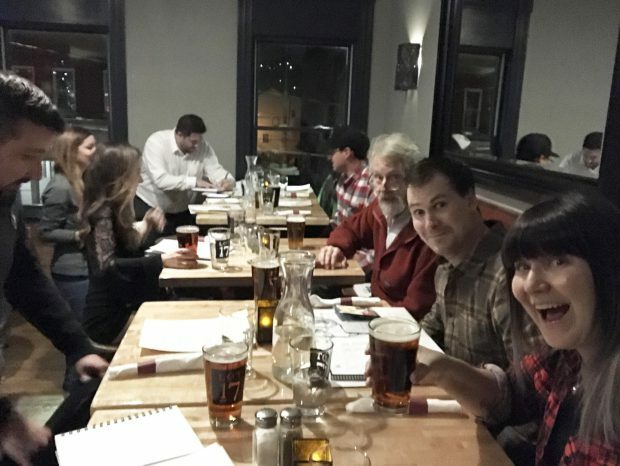 We love beer, and so we were happy to have been invited to the PGH Beer Blogger Dinner last Wednesday on December 6th. The event, presented by the Pennsylvania Beer Alliance (PBA), a full-service trade association representing the wholesale tier of distributors of malt and brewed beverages in PA, featured beers from Fat Head’s Brewery and Great Lakes Brewery paired with dishes from Lot 17 where the event was hosted. At the beginning of the event, attendees were given a packet full of PBA related information, including a document that indicated the economic impact of the beer industry here in Pennsylvania. According to this one-pager, Brewing, Beer Wholesaling, and Beer Retailing contribute 36,512 jobs, more than $1.2 billion in wages, and $4.1 billion in economic output for PA. 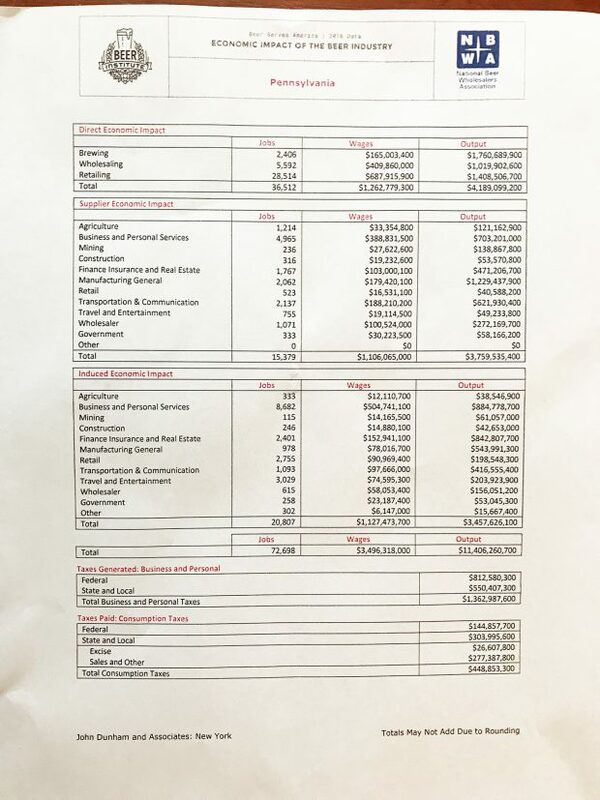 The document also indicated the economic impact on other industries including agriculture and construction. Please feel free to review this document for yourself below. After introductions from Alyssa Gorman, Communications and Outreach Coordinator for PBA, the pairing of six beers and six dishes began. 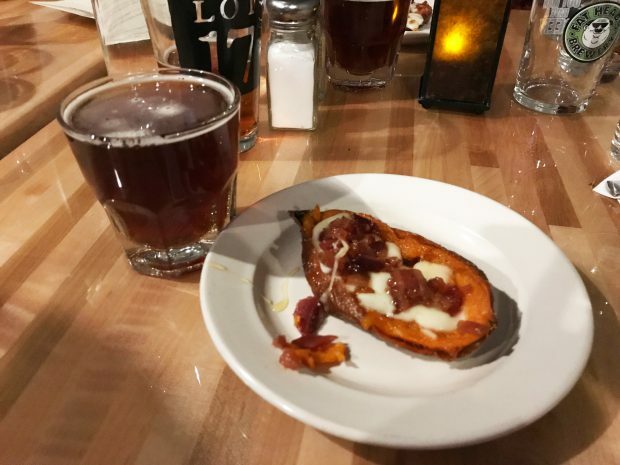 Starting things off was Fat Head’s Holly Jolly (ABV 7.5%) paired with a sweet potato skin with maple bacon drizzle. The pleasant smell of nutmeg came through on Fat Head’s Holly Jolly, and the taste was very smooth. This holiday brew went well with the candied maple atop the potato skins. It’s the kind of pairing you’d want during the gift-giving season. Up next was Fathead’s Headhunter IPA (ABV 7.5%) paired with Swedish meatballs. The Headhunter IPA is crisp and delicious. The yummy taste is so distracting it made us forget to take a photo of this pairing as well as made it hard to taste the flavors found in the meatballs. Great Lakes Edmund Fitzgerald Porter(ABV 5.8%) came next paired with a porter beef stew in a bread bowl. This pairing is the kind you need when you’re snuggling up by the fire. 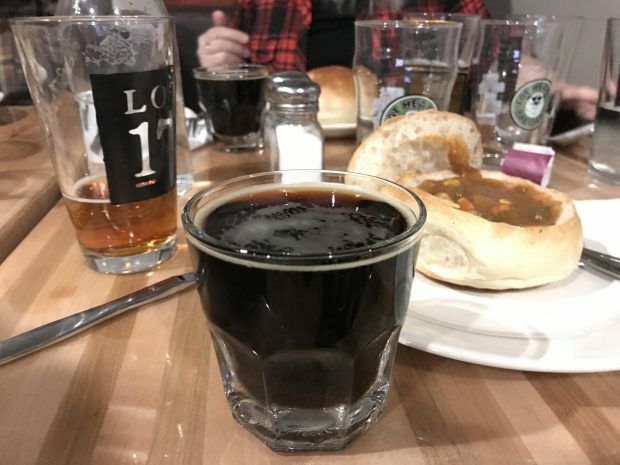 The double porter flavor from both the beer and stew will warm you up, and the bread bowl’s starch will lull you into a well-deserved winter sleep. 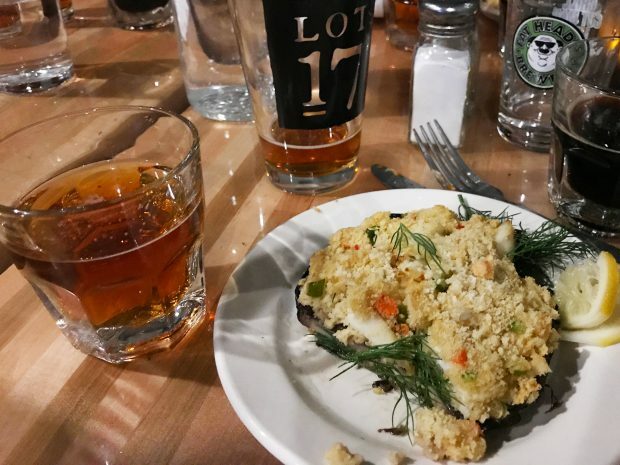 Just past midway in the night’s pairing event came Great Lakes Burning River Pale Ale (ABV 6%) served with a portobello mushroom and crab meat. Those who drink beer as much as we do will understand the complexities of switching from a porter to a pale ale. If you’re not familiar just know porters tend to coat your taste buds pretty well. That being said, the Burning River Pale Ale is the kind of beer that you can drink all day and all night. We actually began our evening and finished our evening with this solid beer. 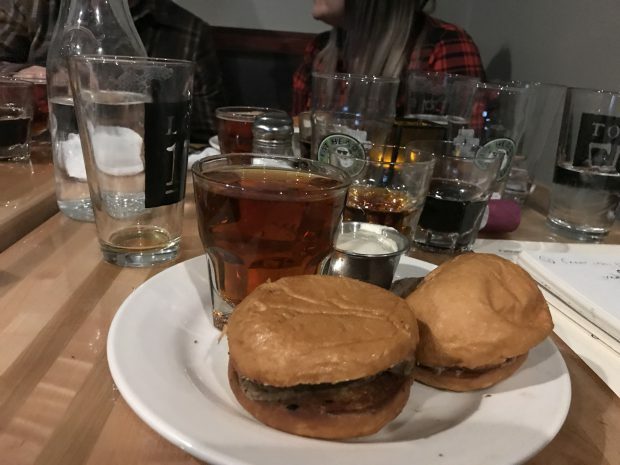 Great Lakes was up next with its own Christmas Ale (ABV 7.5%) paired with rosemary filet slider on a brioche bun. Great Lakes Christmas Ale goes with cinnamon as its holiday spice. The sugar sweet taste went well with the savory meat found in the sliders. The Christmas Ale along with the new friends found at the event definitely got us into the holiday spirit. Finally, Fat Head’s Bumbleberry(ABV 5.3%) served with a berry bread pudding closed out the night. The Bumbleberry has a strong blueberry smell, is soft and refreshing, and goes with Lot 17’s must-have bread pudding. 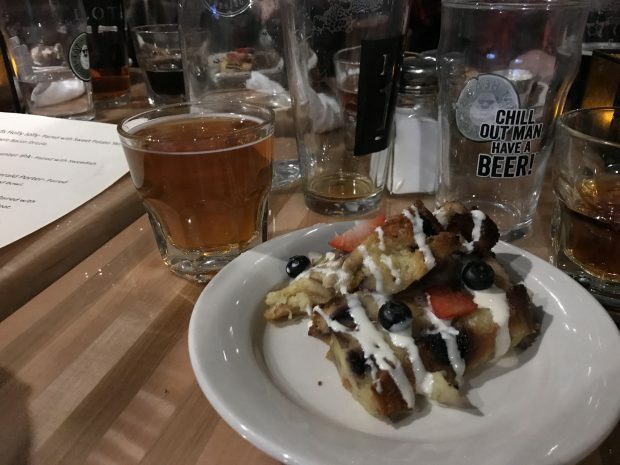 If you’re seeking a perfect way to end a romantic winter evening, do yourself a favor and order Fat Head’s Bumbleberry with Lot 17’s Berry Bread Pudding. All and all this was a pretty fantastic event. Although it’s pretty hard to mess up anything with beer and food, we’d like to toast PBA for inviting us. The brews from Fat Head’s and Great Lakes overall were pretty fantastic and covered a wide range of flavors, any of which would make a Pittsburgh winter day, merry and bright. If you’re interested in trying any of the beers or dishes noted from this event, swing by Lot 17 in Bloomfield.